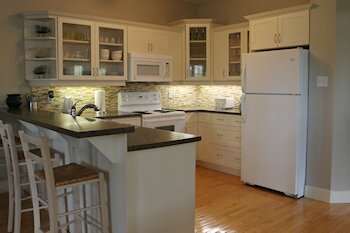 Welcome to our new family cottage in the heart of Grand Bend! Come and enjoy our modern, cottage that overlooks the harbour and is within walking distance to a private beach, restaurants, and town. Our cottage boasts over 3000 sq. ft of living area and deck space making it the perfect place for 1 or 2 families to enjoy a beach vacation. We are located on a quiet street close to bike paths and walking trails. There are 3 decks for you to enjoy the view of the river, watch the kids play on the cul-de-sac, or simply lounge in the sun and relax. Don't feel like cooking? Just stroll across the street to Purdy's famous fish 'n chips or the patio at Smackwater Jack's! The kids can even go for ice cream by the river! You will be able to relax indoors as much as outside. Our spacious, open- concept cottage features a modern chef's kitchen and a family room that walks out to a 500 sq, foot deck complete with outdoor furniture and a brand new BBQ. There is a glassed in sun room for those of you who want to relax with a good book, a gorgeous fireplace in the living room, and dining area for family dinners after a long day at the beach. There is even a mud room for the kids to unload their beach gear with a new washer, dryer and an extra fridge. You can also relax with a movie in front of our 60 inch flat screen TV or play a board game with the family! Our cottage is also close to golf courses, the new Dark Horse Winery, Huron Playhouse, The Pinery Provincial Park, and the antique market. You only have to walk 10-15 minutes to town where you can enjoy the local restaurants, bars, shops, and the public beach. Our cottage is in the center of it all in Grand Bend! 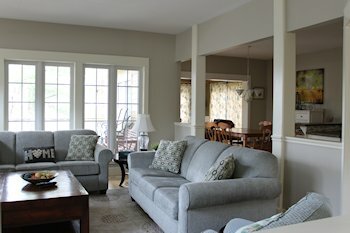 Come and enjoy your "home away from home" at Harbour Woods.